If you are looking to visit Salzburg, Austria but want to stay in a house that is roomy, peaceful and quiet, we have your solution. Situated in the geographical center of Austria, Salzburg is renowned as an idyllic holiday destination. 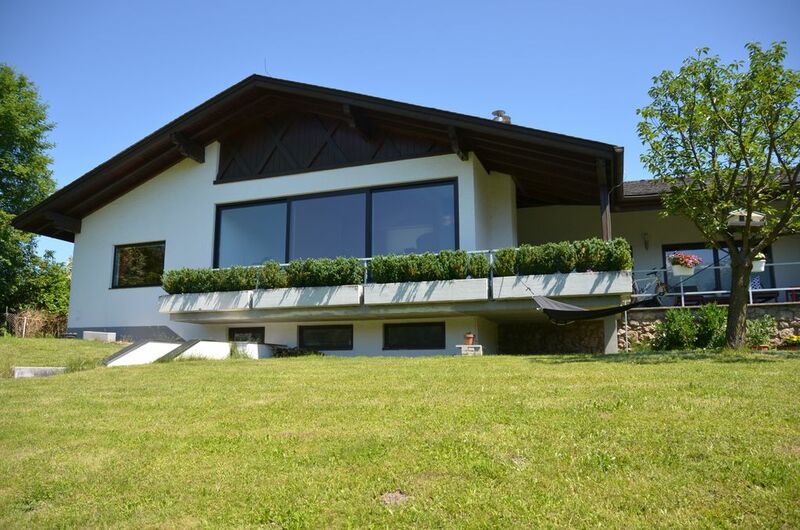 This beautiful modern 136 square meter country house is the perfect place for your visit. With breathtaking views of the majestic mountains and all amenities you are guaranteed a truly relaxing holiday. This totally quiet spot is surrounded by hiking and biking trails. An easy 15KM drive to Salzburg, our house is centrally located for many tourist activities. A short drive to many ski resorts as well as Austria's famous Lake and If Spa areas make it a perfect place for any season. Further Details: This wood floored house sleeps 4-6 with two roomy bedrooms, each with double beds and plenty of storage. There is also a pull-out double sofa bed in the upstairs loft which sleeps 2. The modern kitchen is fully equipped with a radiant stove top, wall oven, refrigerator, dishwasher, microwave, toaster, blender, coffee maker and all dishes, pots, pans and utensils. The large open style living room has 3 floor to ceiling windows revealing fantastic mountain views. A large dining area seats 6 comfortably. There is a full bath and stall shower. Our house is fully wireless, and has a brand new HDTV and cable for your entertainment pleasure. The house has a large yard, BBQ grill and large terrace with table and chairs. Owner lives on premises in separate apartment. something . My daughter skyped a video tour to her friend back home as well I would recommend this house and we will stay here again if available . If you travel here in the winter get a front or all wheel drive car!! We had 20 inches of snow over New Years . There are some good restaurants in the area we liked the Mexican restaurant Topeto they also have take out and the Sefelsmuhle is a local hang out, there are 3 main grocery stores in between the circles but the Sparr seems to be the local favorite. Wow, that view is something! Wow, that view is something, could hardly take my eyes off it. The house was clean and well maintained. Plenty of everything. Lorrie was quick to answer questions and sent me a fantastic list of places to visit and places to stop on our drive from Vienna. So helpful even before we left the UK. Joy was great to have next door, my oldest son loved playing the odd game of football with her son - thanks! What was lovely was having her next door, but if you didn't need her you'd not know she was there! We also had a fab afternoon at the local swimming pool, thanks again for the directions. I have already told all my friends about this wonderful place, not only is the houses location fantastic for sitting and looking out the window but sooo many places to visit within a short drive. Ice caves, salt mine, summer tobogganing to name but a few. I can not express how much fun we had and I am sure this is partly due to Lorrie and Joy. Thanks. Thanks so much for your wonderful review. I'm so glad you enjoyed our house and Austria. Joy and I would be happy to welcome you again anytime. I have stayed many places all over Europe but this may have been one of my favorites. The view is fantastic from the large living room and with a roaring fire and a few drinks you can bet this will be your hang out for most evenings! We were so content chatting by the fireplace that the TV did not go on once during our entire stay. The house is well stocked with many of the basic necessities for your stay and Joy is a great onsite liaison for making sure you have every thing you need without being intrusive. The town of Hallien offers several grocery store options (recommend Interspar) and has a lovely old section for strolling through shops and grabbing a drink. The owner, Lorrie, is happy to answer any questions you have prior to arrival which helps make the stay even more pleasant. The proximity to Salzburg and the many other things there are to do in this area ultimately made this selection a no-brainer. I look forward to having the opportunity to stay here again sometime in the future! Thanks Jon for the Great Review! We are so glad you enjoyed your stay at our house in Austria. We would be happy to welcome you back any time. Have a break from the frantic pace of the big cities, forget the everyday routine and enjoy ultimate in sports and leisure activities in this beautiful region of Austria! Summer has lakes, hiking, biking and walk galore. Winter here comes with plenty of snow, offering great skiing opportunities, clean mountain air, and absolute relaxation in the indoor pools, sauna and the tanning facilities nearby. Surrounded by majestic mountains and set on a plateau among thick unspoiled forests and lush meadows, the Adnet/Hallein area boasts magnificent picturesque environs for a lovely relaxing vacation. Explore the ancient, historic town of Hallein along the Salzach River or visit the Hallein Salt Mines and take a tour. Adnet, a town in Austria, is a community of 3.324 people, located near Hallein in the surrounding area of Salzburg City. Our house is located 15km away from Salzburg city.